How Much Does a Correctional Officer Make? Correctional Officers are the individuals responsible for the supervision of inmates in prisons. They oversee the criminals serving sentences in a jail, penitentiary or reformatory. Entering this profession requires an extensive list of qualifications to be met, along with the fulfillment of training and educational requirements. Even though a formal degree is not required, special academies with focused training programs are designed to teach correctional officers everything they need to understand to handle detainees effectively. Let’s take a look at the basic qualifications for becoming a Correctional Officer. How to Become a Correctional Officer? Even though federal, state and local governments typically have different requirements regarding the correctional officers in prisons and jails, some general requirements may be similar. Each state also has its own detailed set of qualification requirements. If you are planning to become a correctional officer, you need to check the local, state and federal requirements that will be applicable to you. You can do this by simply visiting the website for the department of corrections for the state where you intend to apply for a job. Even though you might not require a formal degree beyond a high school diploma or a GED, it is advisable to invest some time and effort in getting some postsecondary education. A candidate with some level of college education would be in a better position to find higher paying jobs, along with having better opportunities for promotions in the future. This is specifically true for those who plan on working in federal prisons. You may consider a degree in subject areas such as police studies, criminal justice or law enforcement. Coursework will cover topics such as peacekeeping, constitutional law and criminal investigations among others. In some cases, postsecondary education requirements may be waived off if the candidate has prior military service. Once you meet the qualification and education requirements, you will begin the application process. Regardless to say, you need to be in good physical shape before applying for the job and you ought to be able to respond to stressful situations intelligently. Applicants for the position of correctional officer are tested on multiple fronts. These include physical stamina, psychological tests, criminal records, medical condition, background tests and so on. The process itself will contain filling out an extensive application, giving a written test and if called, coming in for a detailed interview. Selected candidates may also be subject to 12 months of training through probation during the first year of employment and training. This is done to make sure that they are capable of handling the pressures that come with the job. Before you apply, make sure you are aware of the exact requirements of your area. Upon graduation from your state’s training academy, you will be required to take an oath of office. The content of this oath varies according to state but generally covers the same subjects – enforcing rules, supervising inmates, inspecting facilities, reporting on inmate conduct and so on. 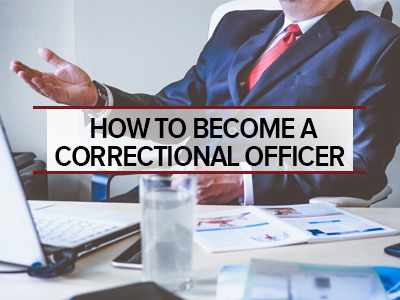 Once you have become a sworn officer and are working as a correctional officer, you may be required to fulfill in-service training requirements. This is done to ensure that all officers on active duty are aware of the latest developments in the field and are trained to deal with them. According to the US Bureau of Labor Statistics, Correctional Officers and Bailiffs earned a median pay of $43,510 per year in 2017. The salary structure for correctional officers and jailers was also similar, with these professionals earning an annual median wage of $43,540 in 2017. The state government employs the largest number of correctional officers, while local governments come in second place. The state with the highest level of employment for correctional officers is Texas, with 48,600 jobs, while the top paying state for this occupation is California, with an annual mean wage of $71,630. New Jersey ($70,400), Massachusetts ($66,060), New York ($63,990) and Alaska ($62,550) are also high paying states for correctional officers. © 2019 How to become A Correctional Officer. All rights reserved.